An all-improved, two-toned, 1.96m inflatable dinghy with new square-shape bow for improved comfort & performance complete with light weight aluminium oars & seat, wooden slatted floor and dinghy accessories. The Plastimo Raid 2 1.96m Inflatable Dinghy is an innovation in dinghy design featuring an all-improved design and two-toned colour finish. The new square-shaped bow (front nose) on the Raid 2 series makes the most of the space on board offering additional comfort for crew and optimum storage area without sacrificing performance or manoeuvrability. Complete with light weight aluminium oars, wide wooden slatted floor, aluminium seat and dinghy accessories including a carry bag & inflating pump. As with all the new Plastimo Inflatable Dinghies only the best German manufactured material is used - Plastel®. Specially engineered for inflatable tenders, this multi-layered PVC with integrated staple weave base fabric features multiple layers, is highly watertight and offers outstanding resistance to abrasion, UV from the sunlight, and marine environment. Plastel® fabric is recyclable and manufactured and quality assured according to the DIN EN ISO 9001 standard. This two man inflatable tender is capable of a maximum load of 250kg and its distinctive 'Square-shaped' bow and low line stern cones provides maximum on water stability and optimised planing. With a rear transom, complete with reinforced outboard bracket, the Plastimo Raid 2 1.96m inflatable dinghy can be fitted with an outboard motor (up to 3.3Hp 4 Stroke or 2.5Kw) making it the smallest in the Plastimo range capable of powered sailing. 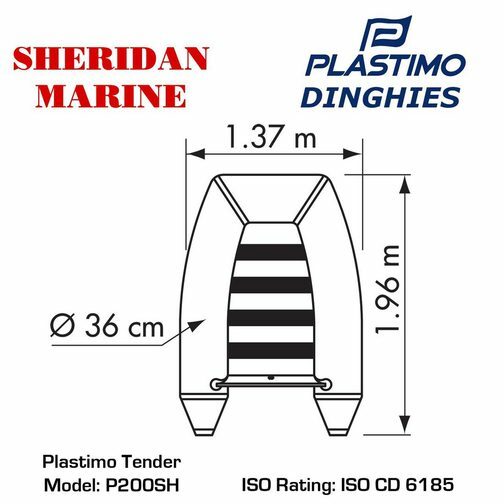 The Plastimo Raid 2 Tenders also features two enlarged 36cm air chambers for added stability and comfort along with wide slatted floor boards which lead to a more solid floor on board with no compromise to roll 'n' stow practicality. Improved Design - The new square-shaped bow (front nose) on the Raid series makes the most of the space on board offering additional comfort for crew and optimum storage area without sacrificing performance or manoeuvrability. Improved Performance - With the all-new, reinforced, lowered stern cones, performance has been improved to optimise planing on the water. Lightweight - weighing in at 17kg it is the easiest dinghy to carry that is able to have an outboard motor attached. Engine Powered - This Plastimo dinghy has a reinforced transom bracket to attach outboard motors up to 3.3Hp or 2.5Kw in power. 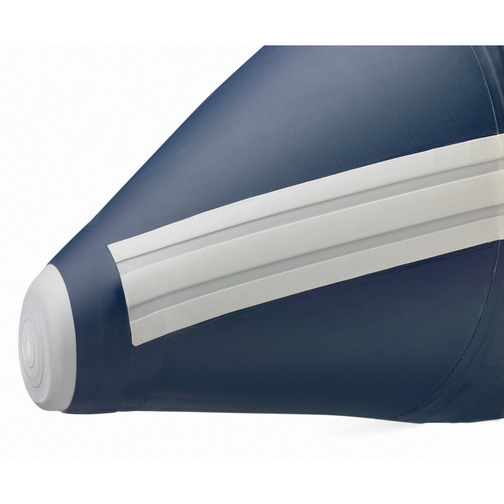 Quick to Inflate - with only two air chambers to inflate the simple foot pump (included) will have you sailing in no time! 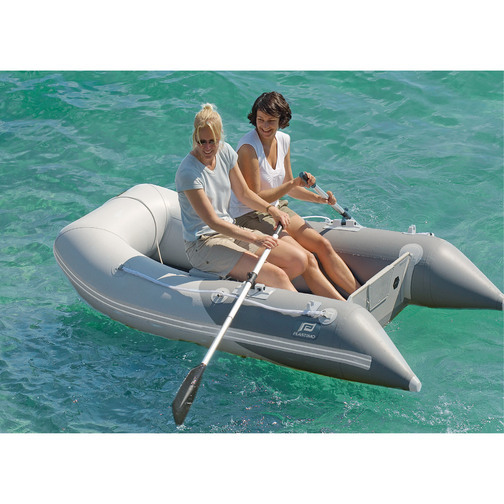 Capacity - with the capability of holding up to 250kg capacity (equivalent to 2 persons with gear) this dinghy has practicality and usability in mind. 4 Year Warranty - as standard on Plastimo dinghies you have the comforting knowledge that materials and seams are covered - such is the confidence of the build quality. Aluminium Oars - detachable and collapsible the oars are positioned in the optimum place for manoeuvrability and operation. Slatted Floor - the wide 35cm wooden slatted floor provides an improved sturdy and robust floor which brings further stability in the water. Grab Rail - a nylon grab rope is positioned around the dinghy to hold on to and it features stainless steel eyes. 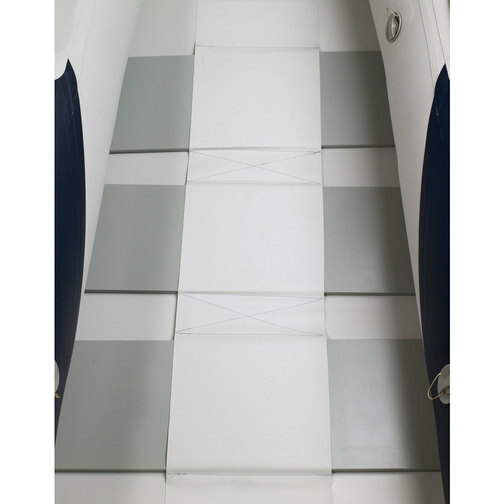 Comfort - an aluminium seat can be placed across the dinghy for rowing and is held in place with robust nylon straps. Two Towing Eyes - made of stainless steel which ensures this dinghy can be pulled along with your cruiser until needed. Enhanced Fender Strip - A tough moulded strake around the widest part of the dinghy helps to prevent damage caused by abrasion. Inflation Valve - High quality 'quick set' valves make for fast inflation and deflation, recessed design protects the valve and eliminates snagging legs or equipment inside the boat. Rubber sealed cover also prevents ingress of sand or water. Additional Equipment - complete with repair kit, carrying strap, bellows foot pump and owners handbook. Safety - tested to ISO CD 6185 which all tenders up to 2.50m must comply with. 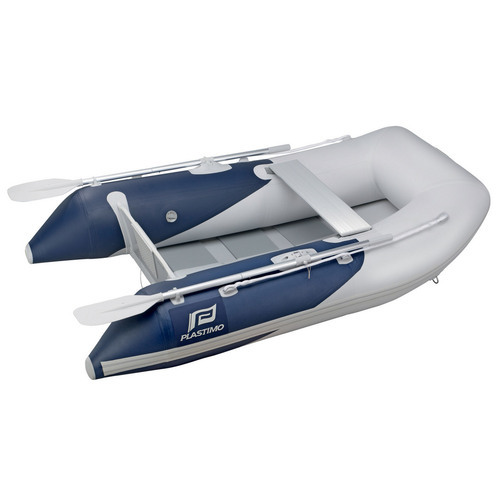 Plastimo design inflatable dinghies to last. That is why they offer a 4 year warranty* on material and seams for the majority of the Plastimo Range offering you peace of mind with your purchase. *4 year warranty on material and seams. Please note: BF080AX is an ex-display model that has been in our River Thames Store. It has not been used but may show some cosmetic marks. This is sold as seen and non-returnable.